“We are the authors of our lives, and, through choice or circumstance, some of us leave our stories unfinished or untold. Though it’s taken me a long while to get here, I’ve come to accept that life, like the vast woodlands that surround my childhood home, is layered with mysteries. 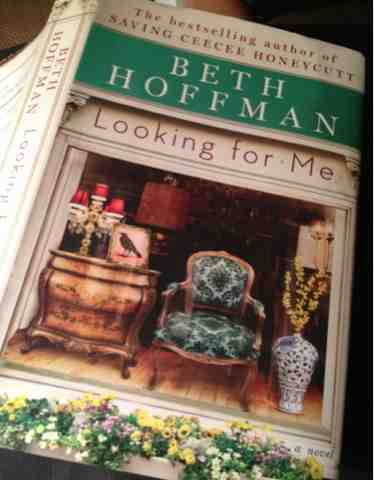 If Saving CeeCee Honeycutt is anything like Looking for Me, it’s no wonder that Beth Hoffman is so well loved. Her writing is evocative of the tender place we call home however each of us defines it. I have never been to Charleston in my life, and yet I could walk the streets with Teddi looking at the fine historic mansions, or walk into her antique shop, as easily as if I was there a million times before. I could see the treasures she had on display, lovingly brought back to ‘life’ through her vision and hard work. I could laugh with her, and Albert, and Inez as they all worked comfortably side by side, invested into the antiques, but more into the relationship they hold with one another. The crux of the story, though, lies in the mystery of Teddi’s brother. Keenly attuned with nature, he would leave her feathers of ravens, or red-tailed hawks, or a bright yellow goldfinch. He would leave rocks, or notes, on her bedside table to find upon waking. And he would leave her completely, not knowing if he was dead or alive, living in the gorge or fallen to his fate. It was a terrible way to live, and having a special Grammy, a best friend named Olivia, and a lover named Sam, could only alleviate her pain so much. I loved this book for exploring my heart, for keeping me in touch with nature and the things of this world which mean something to me, but most of all for acknowledging that there are some mysteries we simply must bear. Can I just say I love the new sidebar? I do. I haven't read any of Beth's work yet, but I know she's a prolific social media user and she is good friends with so many bloggers I love. I definitely want to give this one a try. You can say it, and I'll receive it with joy. I must admit to loving the photographs of Nina Leen, and I'm glad you do, too. This is my first book by Beth Hoffman, too, although I remember Les of Prairie Horizons speaking of CeeCee Honeycutt with great admiration. I can't imagine why it's taken me so long to read one of Beth's books, unless things like my Japanese Challenge got “in the way”. Anyway, I'm glad I've found her now! I think she'll speak to you, too, Andi. I'm so glad my review struck you, Jennifer, because it's often tricky to convey just how wonderful a novel is when it strikes you especially hard. It is indeed lovely. And perhaps you'll relate to the country passages as I did, even though you live in Wisconsin, I live in Illinois, and Teddi Overman lived in Kentucky. Lovely review, Bellezza! The book sounds truly wonderful–I'd like to read both of Beth Hoffman's books. I also noticed your the new B & W photos in your blog's sidebar. Very artistic! Wonderful review of a wonderful book. I adore Beth and her writing. Both of her books are fantastic but I have a special fondness for Saving CeeCee Honeycutt – you must read it! What a great review. I loved this book. As Kathy of bermudaonion commented, do not miss Saving CeeCee Honeycutt. As we can see from the comments, Suko, we both better pick up Saving CeeCee Honeycutt soon! Glad you like the photos in the sidebar, too. Thanks, Elizabeth. I'm glad I was able to download CeeCee when there was a special price on it earlier this summer. It's waiting for me on my nook (with 236 other fine pieces of literature)! Nice review. I loved this story too. I could relate to all the nature references. I was hooked right from the start. What a surprise! Thank you so much for your wonderful review of my novel. I'm delighted that you enjoyed Teddi's story and grateful for your kind words. I enjoyed Saving CeeCee Honeycutt so I'm hoping to be able to read this one soon. I was hooked from the start, too, but I especially loved the ending. It was not too pat and not too sad, but just right. Beth, what a nice surprise to have the very author I've been exclaiming about visit my own blog! I gather you're quite the presence in the book blog world, and that is really great to have your involvement. I am utterly charmed by your latest book, and now I cannot wait to read your first. Thank you! You put into words how I felt about this wonderful novel. Beautiful review. Oh my goodness … thank YOU for investing your precious reading time on my work! Your review is really stunning. I am in the minority with not liking Cee Cee. I'd like to give this book a try though. Like the new punch of colour in your blog layout and if I'm not mistaken is your header font a bit different too? Take care and have a great summer…. Oh….one more comment about the book…the brother in particular….his connection to nature was what I was referring to when I mention his 'strength of character'. Without giving away the story, I know his actions in other respects are controversial! I'll say the same back — if “Looking for Me” is half as good as “Saving Cee Cee Hunnicutt” then I cannot wait! Thanks! Sounds fantastic. I keep hearing great things. Glad that you enjoyed this one. I also liked both books an awful lot. The last paragraph of your review says it all. Glad you loved this one as much as I did. This sounds so wonderful, thanks for bringing it to my attention. I didn't know the author.